The USS President was one of the U.S. Navy's original six frigates ordered by Congress and was built to combat the Barbary Corsairs off the coast of North Africa. Completed in 1800, President was considered to be the fastest ship of her class in the world. On June 23, 1812, five days after the United States declared war on Britain, she fell in with HMS Belvedira while looking for a fight. During an eight-hour chase the President's starboard bow chaser blew up and the Belvedira slowly gained distance and escaped while continuing to fire her stern chasers and having the crew throw a great deal of weight overboard, including her boats. 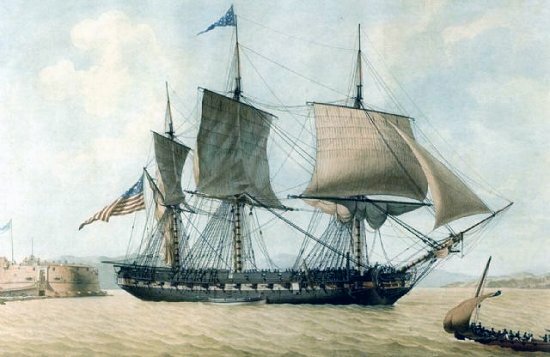 In 1815, her next engagement came involuntary against the 50 gun HMS Endymion, when President tried to run an almost year-long blockade in New York. President had the advantage until HMS Pomone and HMS Tenedos joined the battle. Outgunned and with fifty of her crew dead or wounded she struck her colors. She was broken up at Portsmouth in 1817, after her lines were taken off and used for a new ship of the same name and reputation for speed, HMS President.